Answer: Maybe. It depends on why you are using RDMs. If it is simply to allow sharing or overwriting between physical and virtual. VVols will replace RDMs. If it is to make it easier to restore from array snapshots, VVols will replace them. If it is for Microsoft Failover Clustering, VVols are not supported with that yet. You still need RDMs. Though VMware is supposed to be adding support for this in the next release. See this post for more info. Will VMware in the future support shrinking VVol? Answer: I don’t know. Many arrays (the FlashArray included) allow you to shrink a volume, but this is still prevented from the VMware side. For good reason, to protect you from corrupting a file system that doesn’t like to be shrunk. Can the snapshots of a Windows File server on VVols be integrated with Previous Versions? Answer: I am not entirely sure what this is getting at. But VVol snapshots can be presented to older VMs, or overwritten to RDMs and snapshots of older RDMs can be copied to a VVol (on the FlashArray at least). There is a mechanism to import existing volumes to VVols too. See a post here. How can I do CDM with VVol (provide a production database copy to our dev dba) ? Answer: Any way you want! PowerCLI. Our vSphere Plugin, vRealize Orchestrator. Etc. Does PURE have HA for their VMware VASA provider? Answer: Yes! The VASA providers are in the FlashArray controllers, and the controllers provide HA. You can see them as certified for Active-Active on VMware’s site here. What version of VASA does PURE support for VVols? Answer: We support VASA 3.0 only. 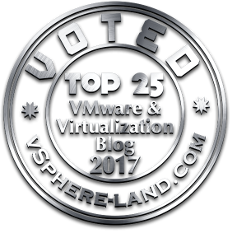 This means you do need vSphere 6.5 to use our VVol implementation. I know you said moving to/from VVols is quick and easy with Storage vMotion but what about FlashArray volumes being replicated to a remote FA. Is it possible to migrating a VM/VMDK on a VMFS datastore with existing FlashArray replication to VVol without losing the FlashArray snapshots/history? Answer: The FlashArray snapshots and replication will not be lost. They are still there and will only be deleted when the retention policy deletes them (or you do). Though they will not be directly related to the VM anymore. They are related to the datastore. But they can be brought up and recovered in the traditional VMFS resignature fashion and then copied over to VVols. The nice thing is that the FlashArray globally dedupes, so you will not lose data footprint because a VM has moved from VMFS to individual volumes (VVols). Mention the new vRealize Orchestrator plugin version!!! Any plan to change capacity reporting so that VMs/VVols with VDP backups do not report as only “shared space” ? Answer: I’ll be honest, I am not entirely sure I understand this question. If you do, or you are the one who asked it, please reach out. Can VVols be used with SRM now? Answer: Yes and no. If you are using vSphere Replication with VVols, SRM can control them. If you are using array-based replication and VVols, SRM cannot. This is not a limitation of the storage vendors–VMware needs to add support for the VVol replication API to SRM. If you want this, PLEASE tell VMware. If vCenter goes down will VMs maintain connection to VVols? Answer: Yes. vCenter availability will not affect currently running VMs. VMs that are running continue to run. Are there limitations around using the Pure VASA provider for VVols with linked vCenters? Answer: Not that I am aware of. In fact, linked vCenters is the only method we support having a FlashArray and its VASA providers talk to more than one vCenter. If they are not linked, we only support one vCenter per FlashArray. Today. We plan on adding support for this soon. Answer: Probably a decent idea to follow. While it is technically okay, the absence of vCenter limits what you can do with VVols until it is back online. The more important limit is if your VASA provider is a VM: NEVER PUT IT ON VVols! This the reason we (Pure) do not offer it that way and put it in the array itself. Does Veeam backup and replication (9.x) currently support VVols? Can a RDM on array1 for a physical server be replicated to array2 and added to a VVol? Answer: Absolutely! Replicate it to array two and then either copy it on the array to an existing VVol or add it up to a VM as a VVol. Does the Pure support VMFS 5 and VMFS 6 datastores to coexist together? Answer: I am not entirely sure if I understand this question, but if you mean linked clones are supported with VVols, the answer is yes. How does resizing a Datastore work? I think expanding a Volume / VVol / LUN / Sub-LUN is pretty simple, but what if I needed to shrink a Volume / VVol / LUN / Sub-LUN? Answer: This varies from vendor to vendor. But it is a non-disruptive process–you can make it smaller or larger. No rescan, reformatting etc is needed. VVols cannot be shrunk, so you would need to just create a smaller one, copy the data to it and delete the older one. This is not an array limitation, just a VMware rule for virtual disks. How does the storage administrator manage storage usage? Answer: The storage container (aka VVol datastore). They set the size and the VMware admin can provision from that. Currently we leverage Rubrik with Pure FlashArray snaps for our large or sensitive VMs. Because of the way snapshots now exist in VVols, I would assume this is no longer needed? Answer: Let me be clear–you still want backup with VVols. There are some value adds to VVols (like instant recovery from deletion) but backup is still very important. Here is a good post. Backup providers need to support VDDK 6.0 or later to be able to backup VVols. Answer: Good eye. This has always annoyed me a bit. The VCG is saying what version our VASA provider itself is. Not what version of VASA it supports. Ours says 1.0, because it is our 1st release. Confusing, I know. A good way to know is if the VASA provider supports replication (as listed here). If it does, it support VASA 3.0. If it does not, it is 2.0. If the VASA provider is not listed under VVols support at all, it is 1.0 and only for VMFS. Storage policies can be applied per datastore, or VM… no way to apply that policy to a Resource Group is there? Answer: I have not seen a way to enforce it on a larger group (VM folder, resource pool, etc). 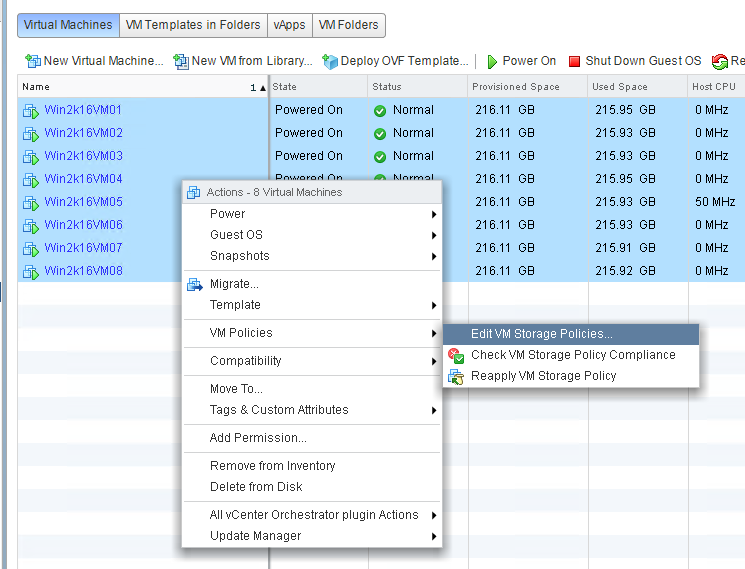 You can however select all of the VMs in a grouping and apply the same policy at once. Of course if your provisioning tool is vRO or vRA or something like that, there are many ways to enforce a policy through that for a grouping. I don’t see anything in native vCenter. But I will investigate further. Our Oracle environment has a lot pure volumes which are separate from the VMs and mpath/nfs mounted. Could we leverage VVols for things like making these Oracle VMs more self-contained? Oracle is a GREAT use case for VVols. Especially because Oracle RAC support was added in vSphere 6.5. Can VMFS5 datastores use VVols? Answer: Well they are different things. VVols uses a VVol datastore. But VM’s on a VMFS-5 (or 6) datastore can be Storage vMotioned to a VVol datastore. Or you can add a VVol to a VM sitting on a VMFS if you just want one VVol and not to move the whole VM. So, if I were to create a single Volume, how does that facilitate requirements for multi-tenant? Today, each “Tenant” has their own Volume for “separation”. Answer: This would be VVol datastores. Different datastores with different sizes. But remember this tenancy is mostly about capacity quotas or “seeing” someone else’s VMs. Not performance, as VVol datastores are not in the data path. Furthermore, you can provision each VM and VVol independently even in the same VVol datastore. You could also use something like vRA to segment a single VVol datastore even further. Does the Pure VVols replication support metro clusters today? Can a single VVol be presented to multiple VMs? Answer: Yes! Just add it to a second VM just like you would add a regular VMDK to a second one. Add existing disk, and enable multi-writer. Can Replication occur across Data Centers? Is the VASA provider that runs on each SP, are the VASA providers Active/Active or Active/Passive for Pure? Answer: Active-Active. This is certified by VMware as seen here. Though vCenter chooses one at a time to use and will failover when needed. The providers are entirely Active-Active though. I assume that Veeam would snap all the volumes in the volume group for the VM being backed up? If so, how does a single recovery function? Answer: I would refer to Veeam for this, here is a webinar from them. Though stay tuned, I will be blogging on this. When is the next VASA version scheduled out from Pure? Answer: In the next month or so. We will continuously update though. If I storage migrate from vmfs to VVols how do I reclaim that space on the original datastore, UNMAP? Answer: Yep UNMAP. Or if the VMFS is empty, just delete it! Can VVol’s still over-provision available storage? Answer: Yes, just like with thin VMDKs on VMFS. Thin VVols can overprovision a VVol datastore. And since the FlashArray data reduces, the VVols themselves are entirely thin and data reduction allows a lot more to be stored than what is actually written. Does Pure have any PowerCLI type VVol management modules? Answer: Nothing directly but the combination of our PowerShell SDK and PowerCLI, you can do everything you need. Watch out for scripts I will be putting out. My first script example drop was for vRO. Does Pure have a vROPs plugin that details information about the PURE VVoLs? Answer: Our management pack exists, but does not have direct VVol support yet (though the volumes do show up). This is planned for a future release. Do you have any future integration plans with VEEAM/PURE for SAN/vvol based backups? Answer: Yes! Keep a close eye on this in the very short term. Is there a downside to VVols? Do I need to be on Purity 5 to use vmware 6.5 vvols or will they run on earlier versions of Purity? Paul–yes, you need both vSphere 6.5+ and Purity 5.0.x+. How many VVOLs do Pure’s arrays support? I’ve found many vendors only support a very low number such as 1000, which is only a few hundred VMs. There are however a few that support up to 1 million. As a large service provider we need support for millions. This is a following to the “…migrating a VM/VMDK on a VMFS datastore with existing FlashArray replication to VVol without losing the FlashArray snapshots/history” question. My FAs are on geographically separated campuses with limited bandwidth (150 Mbps) between them. I have one 15TB volume (VMFS datastores) replicated that I’m interested in changing to VVol in the future. My concern is the time to re-replicate the data now in the VVol from one FA to another. I cannot temporarily move the replication target FA to my primary. Worst case, a full transfer of 15TB over a 150Mbit/sec link would take over 9.26 days. You mention global dedup. Am I correct that global dedup covers the data replicated between both arrays? Assuming the original VMFS and new VVol volumes are replicated to the target FA, does any “real data” go between the arrays when the VMFS volume is Storage vMotioned to the VVol? Or is it just “metadata” or unique IDs of the dedup’d data blocks? Once a FA has replicated data to a target, it will not have to replicate it again for that volume or another one. As long as the data is still there (the replicated snapshot has not been deleted manually or via retention) the blocks of data do not need to be sent again. So if you Storage vMotion from volume A (VMFS) to volume B and C (VVols) the FA should not need to resync the full dataset, just the pointers (metadata). Do you have an answer to how many VVOLs Pure supports? Are you planning to support multiple vCenters without linked mode?